Uzo Aduba accepts her award for Outstanding Supporting Actress in a Drama Series for Orange Is the New Black during the 2015 Emmy Awards. The 2016 Emmy race has begun, and Vulture will take a close look at the contenders until voting closes, on June 27. 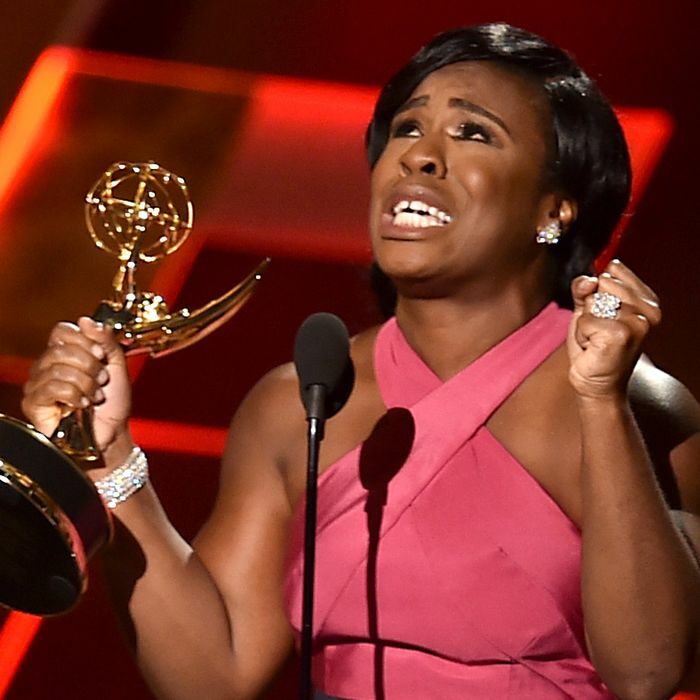 Uzo Aduba, Viola Davis, and Regina King made headlines when they took home acting awards in their respective drama categories at the 2015 Emmy Awards. The wins by three black women in one night stirred excitement — was a sea change underway, some wondered? — quickly followed by an inevitable question: Is this a fluke? Ahead of this year’s Emmys, Vulture decided to investigate. We took a look back at the awards’ track record when it comes to diversity, focusing on representation among actors. In the graphics at the bottom of this post, we’ve documented every nominee and winner for each of the major show and acting categories for drama, comedy, and miniseries since the Emmys began, more than 60 years ago. Given the ensemble casts for many of these shows, we’ve highlighted certain shows based on how much representation there is for actors of color within their casts. A caveat: The numbers here don’t tell the whole story. They can’t account for how fleshed out the characters are on each of these shows or how many lines of dialogue each actor of color is given. Two supporting actors of color on a show like ER, with a huge ensemble cast, don’t necessarily account for as much representation as two supporting actors of color on a show like Lost, where a significant amount of time is spent developing each character. But for the purposes of this graphic, we created designations (explained in our key below) to give a general sense of how much meaningful diversity there has been among Emmy winners over the years. Outstanding Actress for Comedy is, in recent history, the least diverse category — no women of color have been nominated since Phylicia Rashad in 1986, except America Ferrera in 2007 and 2008. Of the 12 nominations for actors of Asian descent, five went to Sandra Oh for Grey’s Anatomy. Of the ten nominations for actors of Middle Eastern descent, eight of them were for Tony Shalhoub’s role on Monk. Two categories have seen peaks in recent years: In the past decade, the number of women of color nominated for Outstanding Supporting Actress in a Comedy is the highest it’s been since a peak in the mid-’80s, while for Outstanding Supporting Actress in a Drama, the number of nominees is the highest it’s ever been. Not surprisingly, there are far more people of color in supporting roles than leading ones on shows nominated for Emmys (making Davis’s win for Outstanding Actress in a Drama last year, quite literally, unique — she is the only actress of color to ever have won in that category). Among the nominee categories, Outstanding Supporting Actor and Actress, for both Drama and Miniseries, have been the most diverse. Of shows with predominantly nonwhite casts or a person of color in a leading role, 25 miniseries have been nominated compared to 38 dramas and comedies combined, even though there have been 457 fewer miniseries nominations in total. Outstanding Comedy + Drama nominations with casts or leads of color, out of 654 total nominations. The nominations for this year’s Emmys will be announced in July, and some of the best series of the past year have featured actors of colors in prominent roles. Will new shows like Master of None, Mr. Robot, and The People v. O.J. Simpson break through? Will returning shows, from Jane the Virgin to Fresh Off the Boat, Black-ish to Being Mary Jane, be recognized? Until then, check out our more detailed, category-by-category breakdown on Emmy contenders through 2015, below. As the key below indicates, the top row of each graphic indicates the winners for that category. For the acting categories, an orange bubble stands for whether the nominee/winner was a person of color (we’ve included all biracial actors of color under this designation). The same orange bubble that denotes an actor of color also designates a show that features a predominantly nonwhite cast (i.e., The Cosby Show). For certain shows, you may notice their classification changes from season to season — that’s because recurring cast members often change, especially on shows with rotating ensembles. *Note: Up until 1964, there were no genre-specific categories for comedy and drama acting awards. On the graphics below, you’ll notice the pre-1964 acting contenders repeat in both categories. For the purposes of our calculations, we looked at each nominee during those years and sorted him or her by genre. For example, Carl Lee appears twice in Outstanding Supporting Actor, Comedy, and Outstanding Supporting Actor, Drama, but he is only counted once in our tally. 1962Car 54, Where Are You? Since 1989, there have been two nominations for shows with predominantly nonwhite casts or a nonwhite lead: Ugly Betty in 2007 and Orange Is the New Black in 2014 (which moved to the Drama category the next year). Between 1992–2004, there were no shows with predominantly nonwhite casts or a nonwhite lead nominated for Outstanding Comedy. Notably, there were seven between 1985–1991 (The Cosby Show, Frank’s Place, Designing Women), and five between 1969–1973 (Julie, The Bill Cosby Show, Sanford and Son, Room 222). Modern Family, which features more than one actor of color in a supporting role, has won for Outstanding Comedy five times, while The Cosby Show is the only show with a predominantly nonwhite cast or a nonwhite lead to ever win in the category. Thirty-eight out of the 324 comedy nominees have featured either a predominantly nonwhite cast (10), at least one nonwhite lead (6), or more than one nonwhite supporting actor (22). In Emmy history, there have been three predominantly nonwhite shows nominated for Outstanding Drama: The White Shadow, I’ll Fly Away, and Orange Is the New Black. NYPD Blue is the only show featuring at least one nonwhite lead to have won for Outstanding Drama, and since 2000, the only show with a predominantly nonwhite cast or nonwhite lead to have been nominated is OITNB. Notably, from 1992–1999, there were eight nominations for shows with a predominantly nonwhite cast, or at least one person of color in a leading role (five of them went to NYPD Blue), and from 1980–1985, there were six (half of them went to Fame). Sixty-four out of the 330 drama nominees have featured either a predominantly nonwhite cast (3), at least one nonwhite lead (16), or more than one nonwhite supporting actor (45). This is by far the show category with the most diversity. Over the years, 15 shows with predominantly nonwhite casts have been nominated for Outstanding Miniseries, and a third of them have won. Peaks include 1989–2000, when 12 miniseries with predominantly nonwhite casts or a person of color in a leading role were either nominated or won. Just in the last four years, four shows with people of color at the center have been nominated (Luther, Treme, The Bible), though one hasn’t won since 2000’s The Corner. Thirty-five out of 197 miniseries nominees have featured either a predominantly nonwhite cast (15), at least one nonwhite lead (10), or more than one nonwhite supporting actor (10). *Note: The Outstanding Miniseries category wasn’t created until 1973. Before then, there was a category designated as “Outstanding Single Performance,” which meant a performance that only occurred for one season or even less. This eventually became the categories of Outstanding Actor and Actress in a Miniseries, which is why, as you’ll see below, those two categories begin in 1955, almost 20 years before Outstanding Miniseries would. Only two nonwhite actors have ever won for Outstanding Actor in a Comedy in Emmy history — Robert Guillaume in 1985, for Benson, and Tony Shalhoub, who won three times for Monk. (Fun fact: Guillaume is also the only actor of color to ever win for Outstanding Supporting Actor in a Comedy, for his role in Soap.) Twenty-eight of the 283 nominees in this category, or 9.9 percent, have been men of color. Shalhoub (who was nominated eight times for Monk), Guillaume (nominated five times for Benson), and Don Cheadle (nominated four times for House of Lies) together make up 61 percent of those nominations. No actors of color were nominated between 1989–2000. Two actresses of color have won in this category — Isabel Sanford in 1981 for The Jeffersons and America Ferrera in 2007 for Ugly Betty. Fifteen of the 292 nominees in this category, or 5.1 percent, have been women of color. Isabel Sanford accounts for seven of those nominations, for her role in The Jeffersons. Since Phylicia Rashad’s last nomination, in 1986 for The Cosby Show, no actress of color has been nominated aside from America Ferrera in 2007 and 2008. This ties with Supporting Actress in a Comedy as the second-least-diverse category among the acting nominees. One actor of color has won in this category: Robert Guillaume in 1979 for Soap. Twelve of the 278 nominees in this category, or 4.3 percent, have been men of color, five of whom were nominated in just the last two years. No actors of color were nominated between 1990 and 2008. Only one actor of color has won Outstanding Supporting Actress in a Comedy in Emmy history — Jackée Harry in 1987 for 227. Twenty-two of the 280 nominees in this category, or 7.9 percent, have been women of color — ten of them were in the period from 1981–1988, while nine have come in the last decade. Marla Gibbs was nominated five times for The Jeffersons, and Sofia Vergara was nominated four times for Modern Family.